he thinks full socialism or whatever is bad. There are degrees of socialism. individual policies Hilary supports may be socialist, but she doesn't want total socialism. In my experience this is exactly how Americans generally use the word "socialist" in political discourse, regardless of whether or not it's the correct definition. What does this have anything to do with US policies? This example of vitriol towards nuance is why talking politics is always so exhausting. There are no degrees of socialism when the entire goal is communism by increment. Degrees aren't incremental you liberal idiot. There's 90 degrees and Xbox 360 and the fabled 900 and that's it. Actually I think there was a snowboarding 1080 game back in the day but they were pushing it. Because when you see it, you turn 360 degrees and walk away! i'm curious to know the logic behind "socialism is bad but individual socialist policies are good." probably nothing, i'm just saying that "a government wanting to help poor people is socialist in any conceivable scenario" is faulty logic. Capitalism generates far more total wealth than communism or socialism because it recognizes what peoples natural incentives are: theyre going to primarily look out for themselves. There are downsides, of course, to pure laissez-faire capitalism (externalities, a poor distribution of the wealth that is created, etc), so I do support regulation, a social safety net funded by taxes, etc to mitigate those problems. But if you go too far in that redistribution (and, I emphasize, I dont think the US has done this) then youll weaken the incentives that drive overall production of wealth. ok, but you didn't explain why individual socialist policies are good. this is just an explanation for why you think full socialism is bad. Socialism isn't "when the government does something" it is collective ownership of capital. Social programs supported by liberals, socdem, and Dem socs are capitalism bandaids that are about minimizing and hiding the inherent flaws of the system to stave off socialisms appeal. But who is saying that? All we're saying is that the US has a ton of socialist policies. Those policies definitely do not help the poor and most don't even pretend to. To follow the Scandinavian model which is such proof that socialism works. Scandinavia is currently failing hard, though. You may want to see the US crumble (faster). Do not expect common sense from such a die-hard globalism supporter. It's funny when the most radical leftist I can think of here understands politics better than the "more moderate" ones. Your absolute support of the status quo speaks volumes about your mental capacity. You needn't say anything more. I hope Trump is right. Socialism is designed for one thing, and one thing only. To bring everyone into economic oblivion. This has been another (probably) uselessly informative post, by me. Booyah! Socialism isn't "when the government does something"
The point I was trying to get across is that it literally does not matter that this is not socialism, because this scenario is exactly what Americans hear when Trump says that the US won't be socialist. To bring everyone into economic oblivion. Ended the poll in a total tie. Quick comments: I am surprised that socialism has this much support in the US, even taking into account that the board is left-leaning. Yuri was right. ...you think socialism is bad? don't you like bernie and AOC? I didn't actually say that. I think socialism can work to some extent, but only when completely decoupled from globalism. That is, providing a safety net for your own people, as opposed to immigrants, etc. But I do not believe in welfare that allows one to live comfortably without working at all, when one is capable of work, for example. It's a rather long topic and a lot of "if"s, but let's say I am not completely opposed to every aspect of socialism. But I do not believe in welfare that allows one to live comfortably without working at all, when one is capable of work, for example. well, good thing that's not what socialism is. if anything, it's communism. i get the confusion as some socialists are in favor of something like this (i.e. universal basic income) and right-wing americans often use socialism and communism interchangably (as can be seen on this board) but yeah, this is not an inherent aspect of socialism. obviously there can be people who exploit the system and live on welfare while being capable of working. but this is a bug in socialism, whereas in communism, it's a feature. regardless, if you think "socialism can work to some extent," it seems weird to post a video that trashes socialism and say "this guy was right." 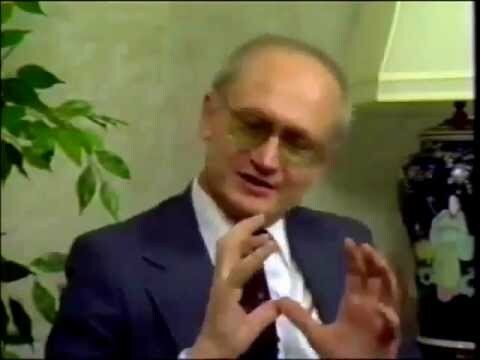 He was specifically talking about KGB activities in the US, the subversion of academia, etc. I am saying he was right because, given the results of the poll, US is really turning into a country that accepts socialism, when a mere 30 years ago a vast majority of the population was hard anti-socialist. KGB's efforts are still bearing fruit, long after the USSR fell apart. well, that's true, people like bernie and AOC are a gazillion times more popular now than american politicians who have tried to advocate socialism in the past (lol nader). you could make the argument that even communism is becoming more accepted in the US in a way, with an increasing number of americans who are in favor of UBI. I agree about communism being more accepted in the US. It's the result of the same subversion efforts. UBI isn't communism at all. It specifically requires a standard capitalist structure and doesn't care at all about where the capital comes from. It might even imply by definition that the capital comes from non-workers. pretty sure the version of UBI people usually talk about is 100% handled by the government. taking that into account, i don't see what about it is capitalist/non-communist. Are you defining government as anti-capitalist? That makes no sense. Communism is specifically anti-government because it's anti-centralized capital, which government necessarily is. Stalin killed all the communists. There aren't any left. Um... That's absolutely wrong. Stalin is one of their heroes. foolmo and cyclo are just using the original, marxist definition of communism. which is fine, but like i said, that's not the way the majority of people use it so for practical purposes it's not the way i define it. wikipedia literally calls stalin a communist in the first paragraph of the article about him. words evolve over time. foolmo and cyclo are like the hipsters who attack people for saying that fall out boy is an emo band because "REAL emo is bands like rites of spring." I don't have to stick to the Marx definition. If you include Stalinism then UBI still is completely opposite because it's about individual ownership of capital and savings and such. Both definitions are anti-personal property, which is the foundation of UBI.